I don’t like pulling images from other sites directly for posts: it’s using the bandwidth from someone else’s website. Instead I’ll save the image, upload it and then credit the image back to the source. I look after a multi-author website and sometimes people forget our policies and I have to edit the post to remove that image URL, download it and upload it. 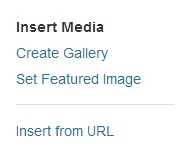 To get around this I wanted to remove the option of “Insert from URL” that’s part of WordPress. A quick search of the internet provided exactly what I needed. Insert this code into your theme’s functions.php file. * Removes the media ‘From URL’ string.